The Beard Club has released a new commercial, that features a heartfelt piece from “the sentimental savage”. The bearded sentimental savage, standing among barrels, reads the poem he wrote about his beard. “Luscious hedge of hair, hardy jungle, so wild and untamed, you grow for me and I grow for you. I brush you, oil you, and you comfort me. My only true companion. My friend. My dear,” he recites, almost shedding a tear at the end. Suddenly, the soothing soundtrack music stops and he asks, in a firm voice, “What? Savage can’t have a soft side?” and then rushes out. The subscription men’s grooming company has been advertising its services in multiple hilarious ads over the time. 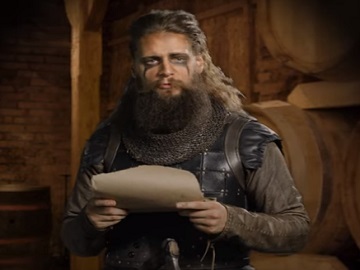 A recent commercial, created in the Game-of-Thrones style, featured Chris Stoikos, co-founder of Dollar Beard Club, urging men to embark on the adventure of growing a beard and advising them to stock up on the brand’s supplies, which include a variety of 100% natural products, designed for all needs. The Beard Club provides a series of kits (The Starter Kit, The Advanced Kit, and The Legendary Kit) containing various products designed to help you get a “softer and smoother beard”, that are delivered monthly to your door. The offering includes all-natural products, oil, balm, wax and more, growth accelerators, as well as beard gear and apparel. Customers can build a kit based on their own necessities, choosing an all-natural beard oil, products from the Essentials range, shower items, accelerators, such as growth vitamins as spray or capsules and/or growth oil, and accessories, such as a beard brush or comb, a stainless comb and/or a sandalwood mustache comb.